The eWheelie Keynamics Laptop Stand is the only laptop accessory on the market which repositions both the laptop keyboard and monitor to a more ergonomic alignment. If you don't want to have to purchase an external keyboard, mouse and monitor to use your laptop in a more comfortable manner on your desk, consider this innovative product which cantilevers the laptop over the edge. 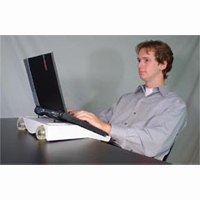 The wheels allow you to simply roll the laptop out of the way when you need your deskspace for other tasks. Available in black and white. Copyright © Micwil Group of Companies Ltd, Micwil is a Registered Trademark of Micwil Group of Companies Ltd.